Fall winds and winter cold take their toll on all skin types, but especially on dry and sensitive skin. Even the things we use to combat cold weather—heaters and hot water—further strip skin of its natural oils, thereby exacerbating dry skin conditions like rosacea and eczema. If your normal ATOPALM regimen is leaving your skin feeling dry or uncomfortable midday, it’s time to add in an ATOPALM mist to replenish hydration when your skin needs it. Our spray-on moisturizers are an excellent way to give your skin a moisture boost in the middle of your day, but they can also be used as your normal daily moisturizer, or even layered with your moisturizing cream to give the skin an added layer of hydration. 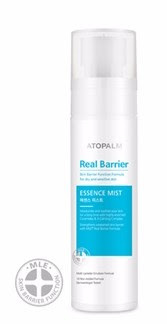 ATOPALM mists are formulated for both the face and body, so you can use them to spot treat especially dry areas, such as eczema-prone knees or rosacea-affected cheeks. The special bottles are created to work at any angle, so you’ll even be able to treat hard-to-reach areas without issue. We currently offer to spray-on moisturizers. Here’s a look at each one so you can choose the formulation that will best address your skin’s needs. Classic Moisture Mist features both MLE and hyaluronic acid for intense moisture that won’t feel heavy or cloying. Pentapeptide-4 further moisturizes and conditions the skin while also providing anti-aging benefits like reducing the appearance of fine lines and uneven skin tone. Moisture Mist is a great choice for those who are working to prevent visible signs of aging, or those who prefer simple, effective skin care. Real Barrier Essence Mist also contains MLE and hyaluronic acid for complete, long-lasting moisture. Instead of anti-aging actions, Essence Mist differs itself from Moisture Mist by featuring Real Barrier three-calming complex, a blend of panthenol, madecassoside, and allantoin that deeply soothes and comforts sensitive skin. Essence Mist is a great choice for those whose dry, sensitive skin requires a little extra protection against possible irritation. Don’t let skin suffer through harsh weather this fall and winter. Add your favorite ATOPALM mist to your regimen to put your best face forward all season long.